Azadeh received her Doctor of Dental Surgery (DDS) in 2003 from Tehran, Iran. After moving to the UK, she started her PhD in Tissue Engineering and Biomaterials at world renowned University College London (UCL), in 2007. Her main research interest was focused on developing novel biomaterials used in bone regeneration. 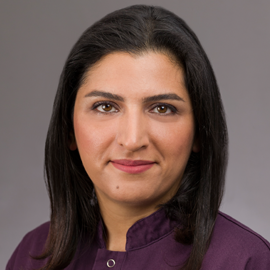 During her research and clinical practice, her special interest in Periodontology grew and led her to pursue a 3-year specialist training course focusing on Periodontology and Implant dentistry at Eastman Dental Institute, UCL, which is the only one in the UK that is accredited by the European Federation of Periodontology (EFP). Following successful completion of her speciality program, she was awarded the degree of Master of Clinical Dentistry (MClinDent) in Periodontology as well as an EFP Certificate in Periodontology. She also obtained the Membership in Periodontics (MPerio) from the Royal College of Surgeons of Edinburgh. Azadeh has gained extensive experience in the field of advanced gum disease treatment with expertise in non-surgical and surgical treatment of periodontal and peri-implant disease, including conventional and regenerative periodontal surgery. She is also involved in the reconstructive/cosmetic aspects of periodontal (plastic) surgery, improving the smile, applied to both teeth and implants.